"Apart from the slightly unstructured interface, a solid program." Transparent Language may not have the brand recognition of companies such as Berlitz, Rosetta Stone and Pimsleur but since starting in 1991 they have developed a good sized following in the language learning market. They have specifically focused their energies on the corporate and government market although their products are also available to the general public as well. Currently the language course are used in over 12,000 schools and universities. In this review I will examine the strengths and weakness of the Transparent approach to language learning. I will also detail the different types of learning products offered by Transparent. Finally I will offer an overall recommendation for Transparent language learning and compare it with some of its competitors in the market. Transparent Language Complete - This software package contains three separate levels and is designed to take the complete novice learner through to an advanced level of ability. It features 15 immersion style lessons, flash cards and 2000 word vocabulary builder. There is also between 4 and 5 audio CDs to allow for mobile learning. The cost for this software course is $179.95. Transparent Language Online - This is a completely web delivered course which features a learning essentials course, the Byki vocabulary builder and a refresher system. Access to the online course costs from $16 a month up. In addition there is a free trial option available on the website. Everywhere Audio Course - The Everywhere Audio Course is audio only and available both as a downloadable MP3 or CD. The audio course includes vocabulary, grammar and pronunciation and is composed of 35 separate lessons. It is available for $49.95. Byki Mobile - Smartphones have become an essential part of 21st century life for most people but language teaching companies have been slow to capitalize on this trend. With Byki Mobile, Transparent demonstrates how it is keeping up with technology and allowing people to learn through their phones. The Byki mobile application is designed to develop students vocabulary of 1000 core words. Transparent Connect Live Tutoring - Connect Live provides you with your own personal instructor who you can interact with via the internet. This allows you to enjoy conversational practice with a native language speaker and ask them specific questions. You also get access to an accompanying self study course. This option is relatively expensive at $99.95 for 90 minutes of live teaching. Alternatively you can attend the live classroom which is an eight week course with one hour lessons which costs $299.95. Plenty of variety - If you like variety in your language learning then you will probably enjoy the transparent approach. With interactive conversations, quizzes, flash cards there is always something different that you can try. 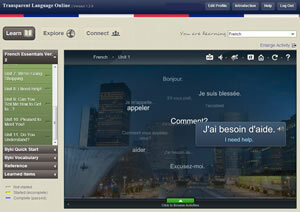 Many different ways to learn - Transparent offers one of the best product ranges of any language learning company. Innovative offerings like the transparent language online program which starts at $16 per month provide a great way to get quality educational material at an affordable price. Audio only learning available - The Everywhere Audio course is included with Transparent Language Complete but can also be purchased separately. With 35 lessons available it is a good way to learn while on the go and it is nice not having to purchase the full course to get access to it. Great range of languages - Some language teaching companies stick to offering only the most popular languages such as French, German, Spanish and Mandarin but Transparent includes in their selection 105 different languages. No matter what language it is that you want to study you will probably find it on the Transparent website. Less expensive than many competing products - At $179.95 for the full course, Transparent's products are priced in the mid range. Less expensive than a Fluenz or Rosetta Stone course which are typically upwards of $300 but pricier than Rocket Premium at $99.95. At this price Transparent offers good value for money considering what is offered. Excellent customer and technical support - Transparent works with a wide range of corporate and government clients and so its customer service needs to be top notch. If you experience any problems with the product it is easy to get in contact with Transparent via email, post or toll free phone. Badly structured - Transparent offers a lot of different language learning features such as flash cards, quizzes and interactive lessons. It also gives a lot of flexibility about which of these features you want to use. While this can sometimes be convenient it not always clear which of the features you should be choosing at any given time. Compared to courses such as Fluenz or Pimsleur it appears to be badly structured and could benefit by providing more direction. Lessons are generic - Most of the lessons offered in the courses are fairly generic and can be uninspiring to learn from. Making the scenarios a little more interesting would increase the appeal of the courses. Over reliance on flash cards - Transparent courses have a strong emphasis on flash cards. If you like this type of learning then you will probably enjoy studying using their system. For many students however the over use of flash cards may make the course less appealing. Also using the freely available Anki software you can achieve much the same effect which negates the value in purchasing Transparent's product. Lots of interactive quizzes and flash card activities. Includes an audio-only course as well (Audio EveryWhere). Uses a broad range of different learning methods (Repetition, games, cards, etc.). The overly generic lessons can be uninspiring. Transparent offers an excellent range of products and has kept up with new trends in technology including web based learning and mobile applications. It also offers one of the best ranges of languages among the language teaching companies. If you don't mind the slightly unstructured interface that is used in the software course then Transparent might be for you. If you are looking for a more structured and less expensive course then Rocket Languages offer a good alternative. Transparent offers a free trial of their web based learning course and so this is a good place to start if you are interested in seeing if their teaching methods are right for you.